In 1995, Enix America closed, throwing plans for an English release of Dragon Quest VI into doubt. "I may not live long enough to see Dragon Quest VI," wrote one fan. She wasn't exaggerating. She was 76 at the time. After 15 years, Dragon Quest VI will get an English localization on Feb. 14, but it came about six weeks too late for Edith Jeter of Puyallup, Wash. A 1996 edition of Nintendo Power discussing Enix America's closure featured Jeter's letter. "I'm now 76 years old. I may not live long enough to see Dragon Quest VI unless someone takes action soon," she wrote. 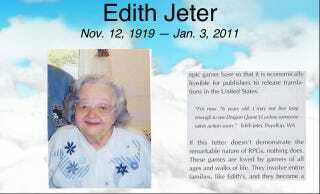 Urban Champion-e, a forum member at Racketboy, ran across the issue and letter recently and wondered what became of Mrs. Jeter. After a Google search, he discovered she died peacefully at her home on Jan. 3. She was 91. She is survived by two children, and numerous grandchildren, great-grandchildren, and great-great grandchildren. "Edith enjoyed reading, playing video games, and was an author of a family genealogy book that she proudly distributed to her family," says her obituary. The obituary's guest book contains this tribute. Your letter in Nintendo Power Volume 82 was the first thing I thought of when I heard DQ6 was finally coming to America. I never knew you, but you and your family are in my thoughts and prayers.